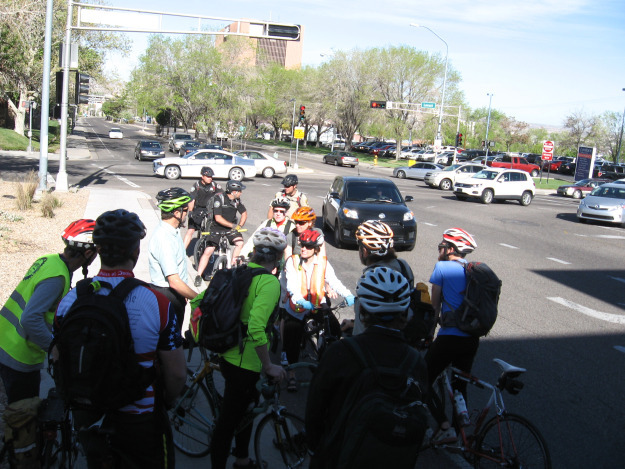 A few weeks ago, Steve Clark from the League of American Bicyclists visited Albuquerque to evaluate our ability to become a more bike friendly city. This fantastic article covers the exciting events which occurred on that day and what this all means for Albuquerque. 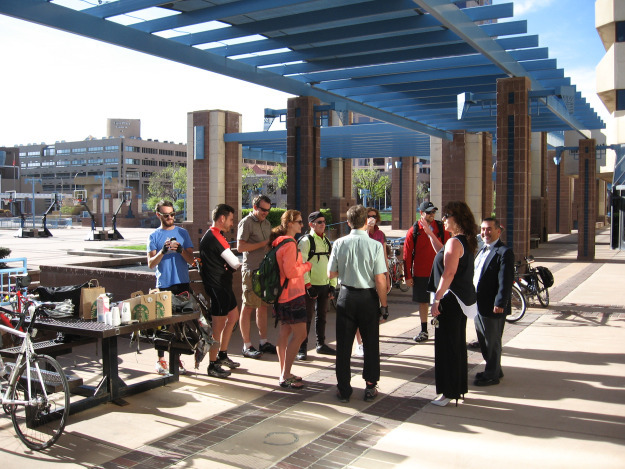 On Tuesday, April 8 Mayor Berry kicked off his 50 mile healthy travel initiative with a ceremony on a trail linking the Mile High District to Uptown in Albuquerque. This coincided with a visit by Mr. Steve Clark from the Bicycle Friendly Community program run by the League of American Bicyclists. The day’s festivities moved Albuquerque in healthy directions. Cities that rate highly as walk and bike friendly also rank as top places to live. Elected officials, professional staff, businesses and community advocates are working on this synergistic development. We met at City Hall in the morning. The plan was to take a bike ride with Steve and look closely at Albuquerque’s transportation system from a bicycling perspective. First we had coffee and greetings. This meeting would be a fun one to do every day. A screenshot from the KRQE news story. 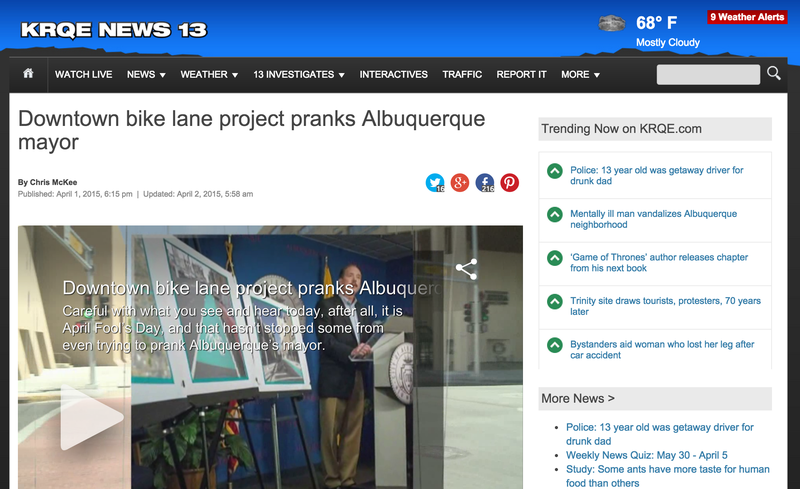 On April Fools Day, we were all astounded by the response to our fake article about turquoise colored bike lanes in Downtown Albuquerque. It was covered not just by the local news but by Streetsblog, a national progressive transportation policy news source. 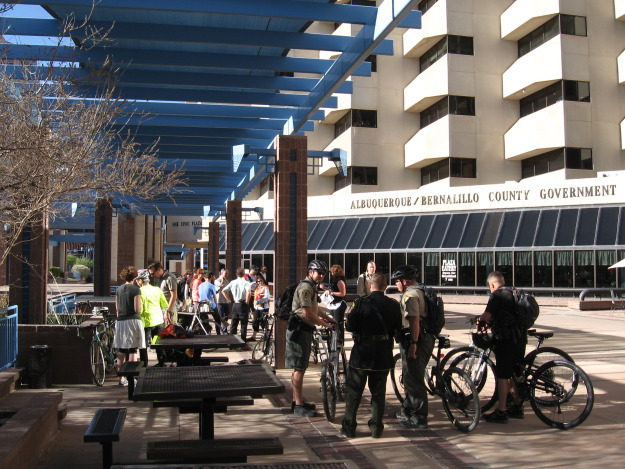 There are many different options available for bike infrastructure, so we will be explaining some of them and providing recommendations for where they might work in Albuquerque. We would first like to apologize to anyone we may have led astray. Our intention was not to lead anyone on but to stimulate a productive dialogue about what we want to see Downtown and across the city. EDIT: April Fools! Read all about the joke and the possible positive implications on the Streetsblog website. 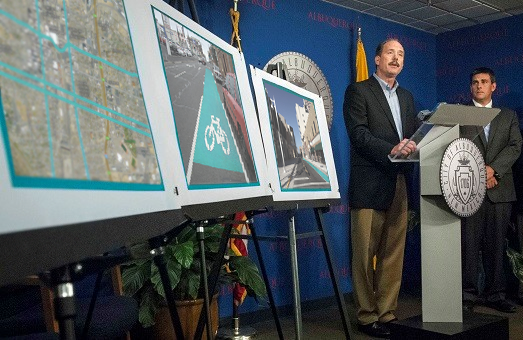 Mayor Richard J. Berry announced that the City of Albuquerque will be developing turquoise-colored buffered bike lanes on several Downtown streets. 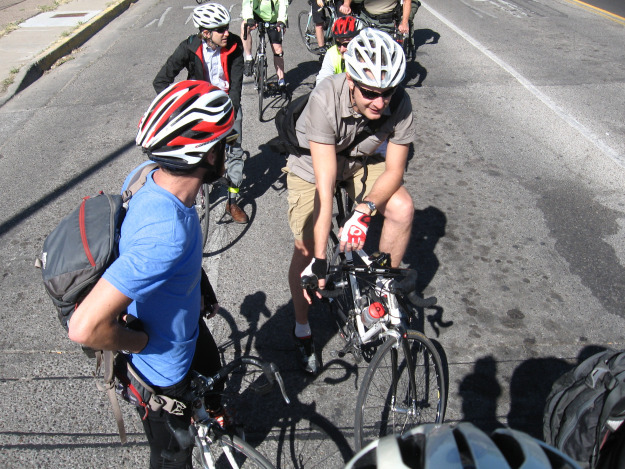 The project is part of the Mayor’s Challenge for Safer People, Safer Streets, an initiative of the Federal Highway Administration to improve bicycle and pedestrian safety across the country. “Improving our bicycling infrastructure is critical to maintaining the excellent quality of life in our great city. Visitors and residents are attracted to our active and unique lifestyle and I believe this project will attract more businesses and millennials to Albuquerque,” Mayor Berry said. 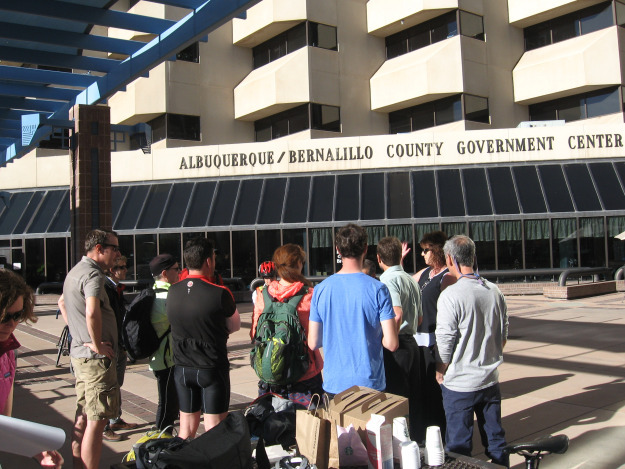 “These new bike lanes will lay the groundwork for Albuquerque to be the most bike friendly city in the United States and will create economic opportunities and jobs throughout Albuquerque.” The plan was endorsed by Mi ABQ, a group of millennials actively working to improve Downtown Albuquerque. 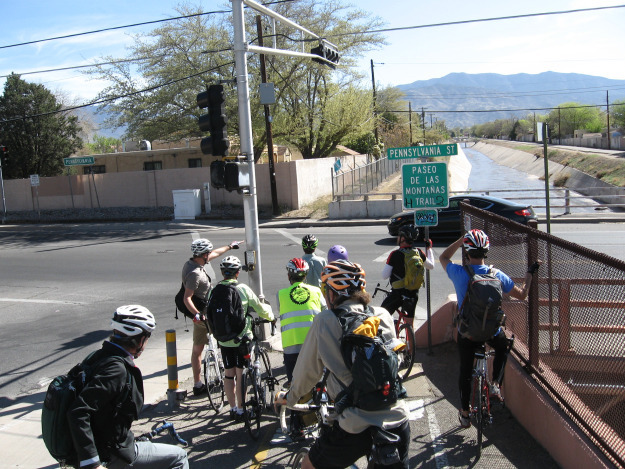 The $4.7 million project identifies 13 miles of on-street bikeways that will be completed by early 2016 and will serve to connect areas such as the Rail Yards, Innovate ABQ, and UNM. The streets slated for these improvements include Broadway Boulevard, 4th Street, Tijeras Avenue, Dr. Martin Luther King Jr. Avenue, and Lead and Coal Avenues. The plan falls in line with recent measures by the City that focus on pedestrian, bicycle, and transit-related street designs — the Complete Streets ordinance, which passed unanimously at City Council in January, and a walkability analysis by renowned consultant Jeff Speck that was released in late 2014 and adopted last month. Speck’s report laid out principles for a useful, safe, comfortable and enjoyable roadway network, as well as recommendations for improvements to specific downtown streets.